We first introduced the Rogers LS3/5a speakers to America before they were officially imported into this country. We bought them overseas because we had heard of their reputation in England. In fact, the Rogers speakers were the first commercial version of the on location monitors developed by the BBC. 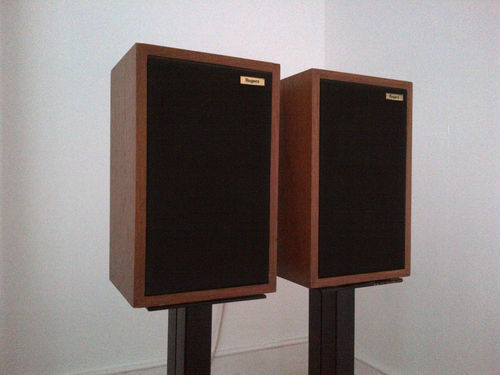 Their speakers were a real breakthrough in monitor quality speakers due to their size and musically. Yes, they were colored with a mid-bass hump but they were also clear and had great resolving power. And they imaged like few other speakers. What was the secret behind them? Great engineering. The speakers were boxes but did not sound like boxes. There was little sidewall resonances. The drivers themselves were well damped. The crossovers were very sophisticated. The region of driver crossover were mostly outside the range of human voice. The KEF drivers were very good and were hand-selected and matched in frequency response. The design was a typical British “monitor” design. The speakers were meant to be “freestanding” and out in the room, away from walls. Tweeter dispersion was controlled so as not to excite room resonances. It is much easier to get the crossover right between two drivers as opposed to multiple drivers. There was no deep bass but a subwoofer could be used to good effect it carefully integrated into the system. (The real advantage of a subwoofer is to reduced distortion in the midrange by keeping the smaller drivers from having to work so hard.) The subwoofer, of course, could add a low-end but it could also greatly improve power handling. These speakers had their limitations. They could not fill a big room. However, in a smaller room they could almost transport you to the concert hall, provided the source material was good. Overnight they became a sensation. They are still valued and collected by audiophiles. Some may still listen to them (secretly). These speakers were never cheap. Today, even on the used market, they fetch outrageous prices, especially if they are the original model. Other manufactures besides Rogers made the LS3/5a’s. The quality was a bit uneven across the board. The version made by Spendor was exceptional, however. There are modern extensions of the design which now cost more than the genuine article. Some just may be worth it! But that is another story. Time moves on. There is a modern speaker sensation that rivals the breakthrough of the LS3/5a’s. It is also a small speaker. It is also very musical. It really is a monitor design although it is not marketed that way. And the good news is that it is relatively cheap.